US equity indexes closed significantly weak, sp -30pts (1.1%) at 2713. The two leaders - Trans/R2K, settled -1.3% and -1.6% respectively. 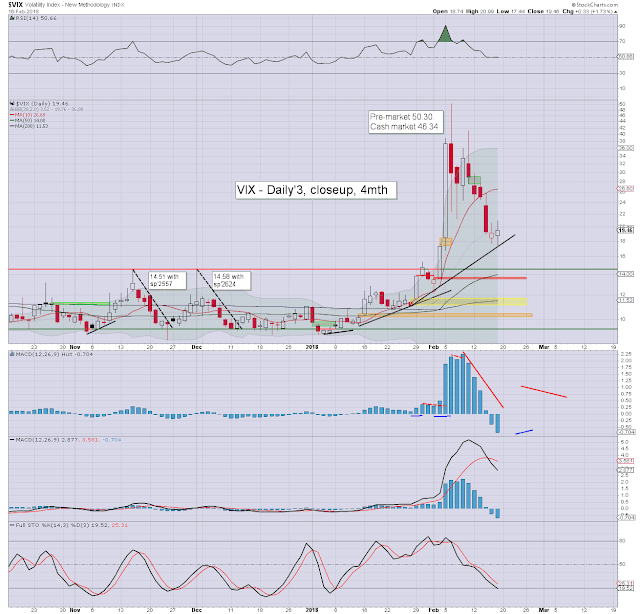 VIX settled +6.8% at 19.85. Yesterday's bearish engulfing daily candles were confirmed, offering further weakness at least the basic 38% fib' of sp'2691. 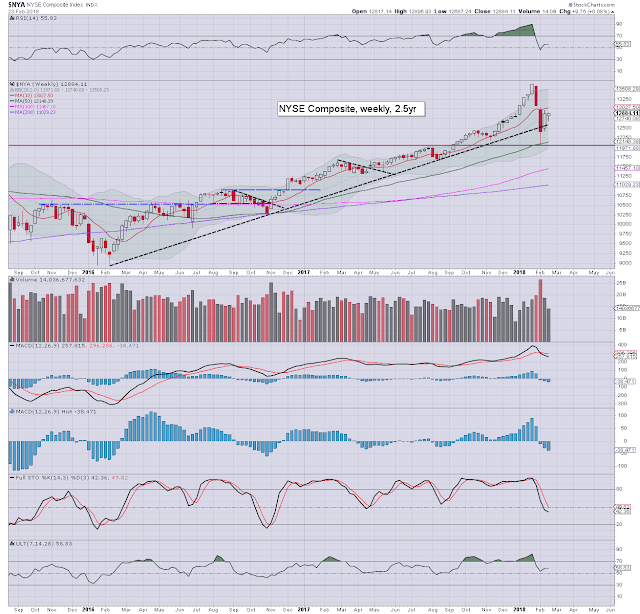 Yesterday saw bearish engulfing candles for most indexes. This morning opened moderately higher, climbing to 2761, but then we saw another significant reversal to settle net lower.Today's failed gains fully confirm yesterday's reversal. We're arguably seeing the first proper retrace from the initial wave of 2532>2789. The 38% fib' retrace of 2691 looks highly probable. With equities unravelling into the late afternoon, the VIX surged from a morning low of 17.39 to 20.44, and settling in the upper 19s. Further upside to the 22/25 zone looks probable. 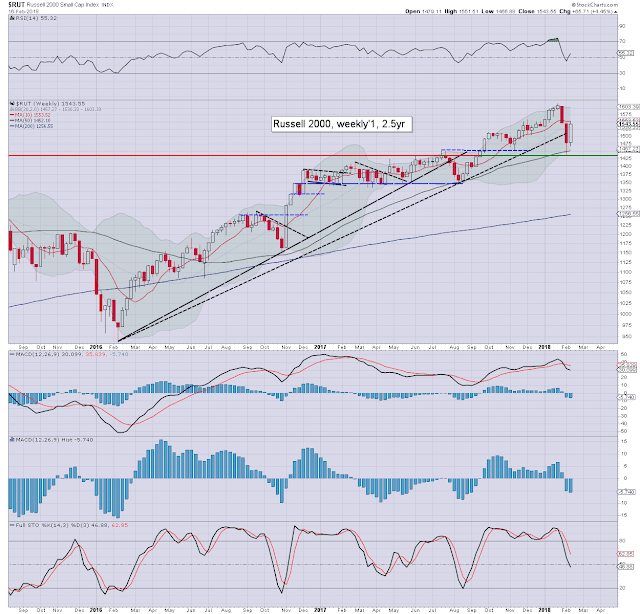 Yes, the sp' saw a very significant net monthly decline of -110pts (3.9%) to 2713, but this was far above the intra month low of 2532. Note the hyper spike from around the key 10MA. 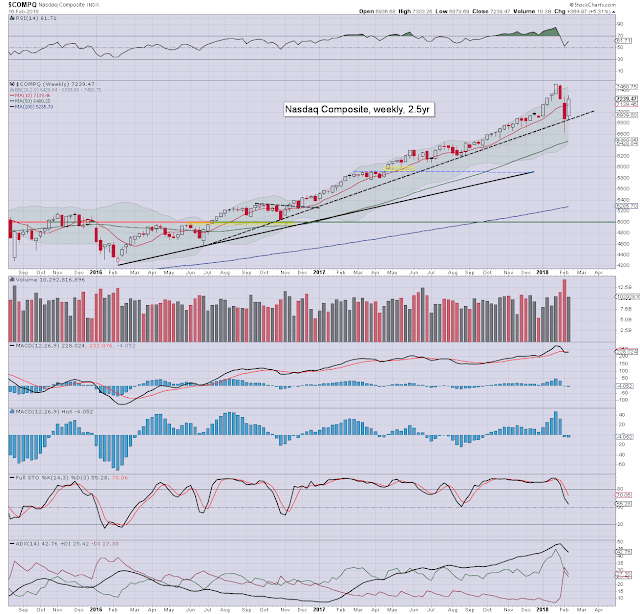 M/t upside to the 2950/3047 zone still looks due, where the market will be highly inclined to become seriously stuck. US equity indexes closed on a significantly weak note, sp -35pts (1.3%) at 2744. The two leaders - Trans/R2K, settled -2.3% and -1.5% respectively. 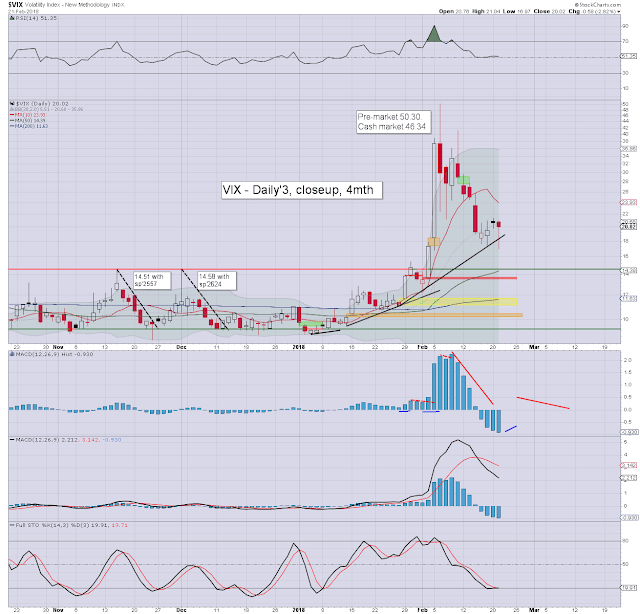 VIX settled +17.7% at 18.59. 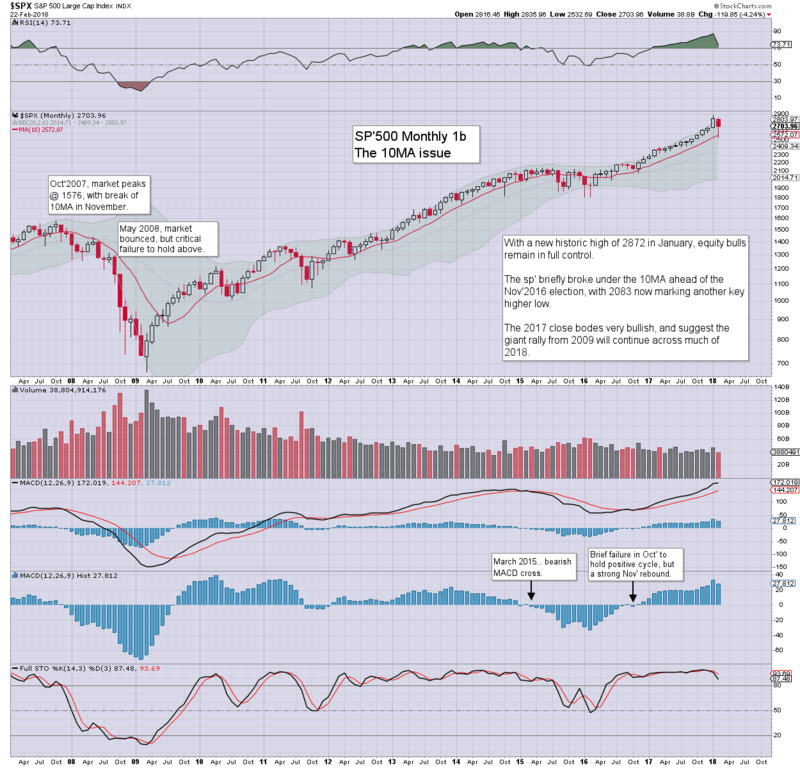 Near term outlook offers renewed upside to the 2800s in March. More broadly, big target remains the 2950/3047 zone. US equities opened fractionally mixed, but then clawed upward to a morning peak of 2789, notably just 11pts shy of the 2800s. As Powell was questioned by the US house, the algo-bots used some of the comments on inflation and rate hikes, to knock the market lower, settling the day at 2744. With equities leaning a little weak, the VIX picked up, battling back into the 18s. 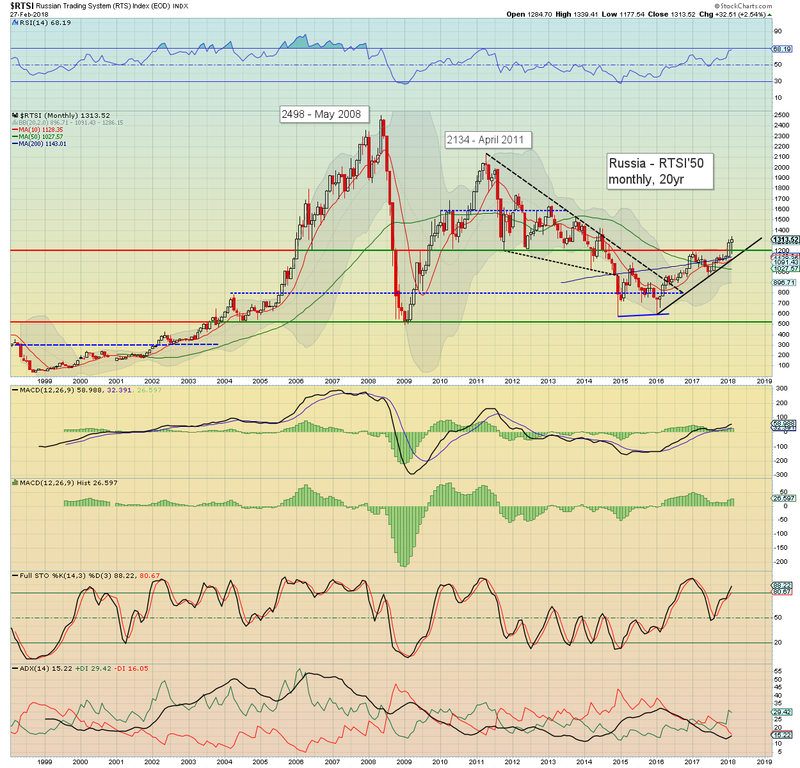 I recognise most will not see the relevance, but the Russian equity market has swung from an intra month low of 1177, and is currently net higher by 2.5% at 1313. Big target is psy' 1500, and that is clearly some months away. Indirect bullish implications for other world markets, and that includes the USA. Sunshine between the snow showers. US equity indexes closed significantly higher, sp +32pts (1.2%) at 2779. The two leaders - Trans/R2K, settled +1.8% and +0.6% respectively. VIX settled -4.2% at 15.80. Near term outlook offers a push into the 2800s. 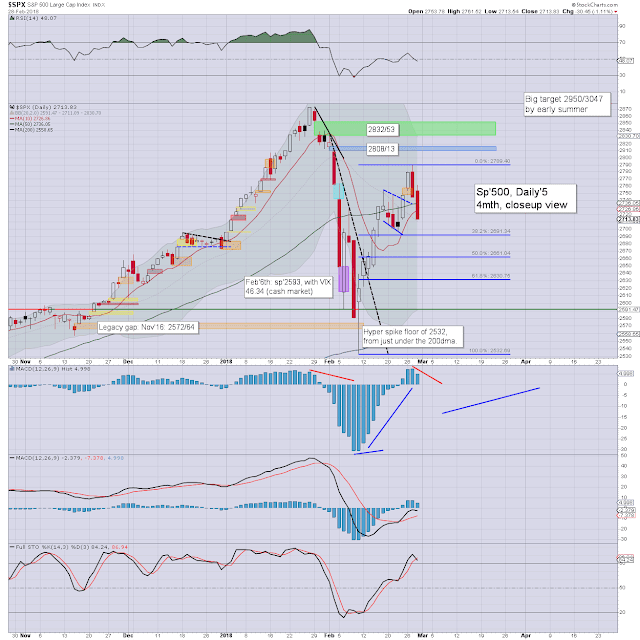 More broadly, big target is the 2950/3047 zone, which is where the main market should get seriously stuck. US equities opened moderately higher, and built significant gains across the day. With the sp' settling at 2779, this is an extremely powerful 247pts (9.8%) above the Feb'9th low. Volatility was naturally ground lower for a fourth consecutive day, with the VIX settling in the 15s, the lowest level since Feb'2nd. 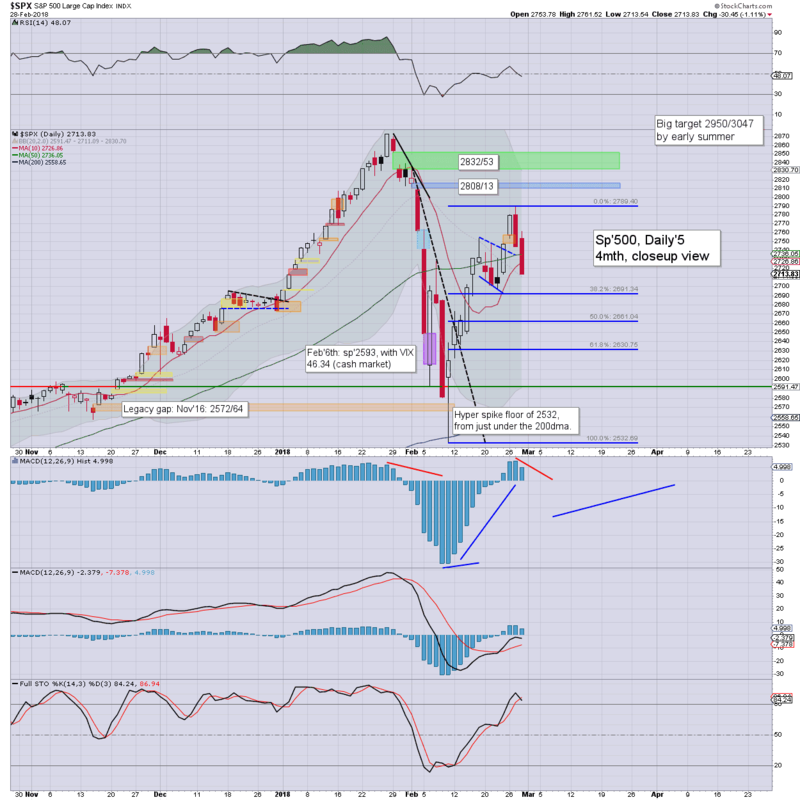 Your truly remains mid term bullish, as original 'big target' of the sp'2950/3047 zone looks on track for late spring/early summer. Then things will get 'real interesting'. With just two trading days left of the month, the Japanese market is still net lower by a very significant -4.1% at 22153. Note the spike low from around the key 21k threshold. 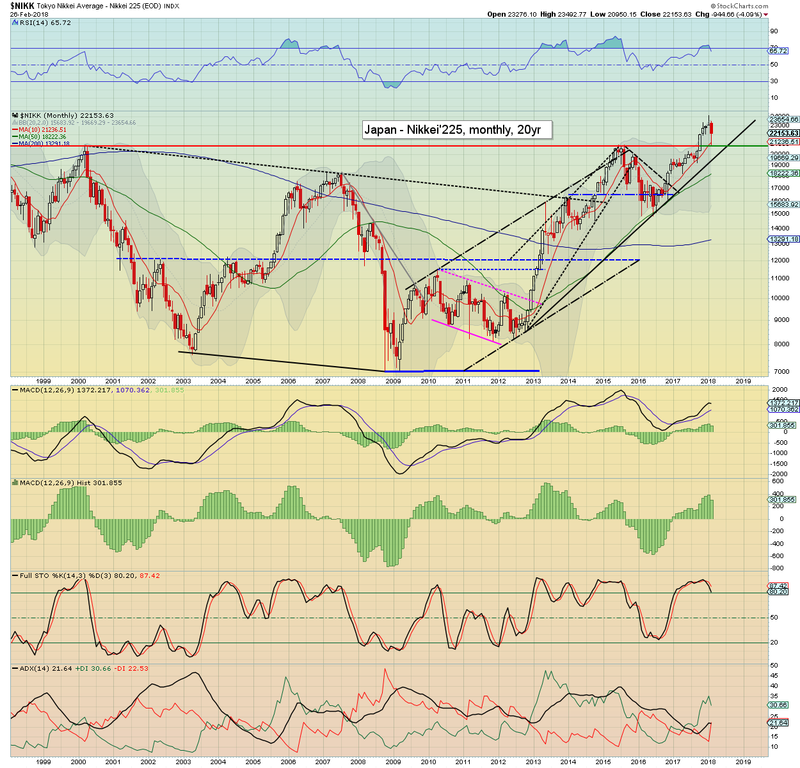 Further, note the key 10MA,which the Nikkei is set to close well above. The bulls should be very relieved. It was a choppy week for US equity indexes, but ending on a positive note, with net weekly gains ranging from 1.3% (Nasdaq comp'), 0.5% (sp'500), to 0.1% (NYSE comp'). 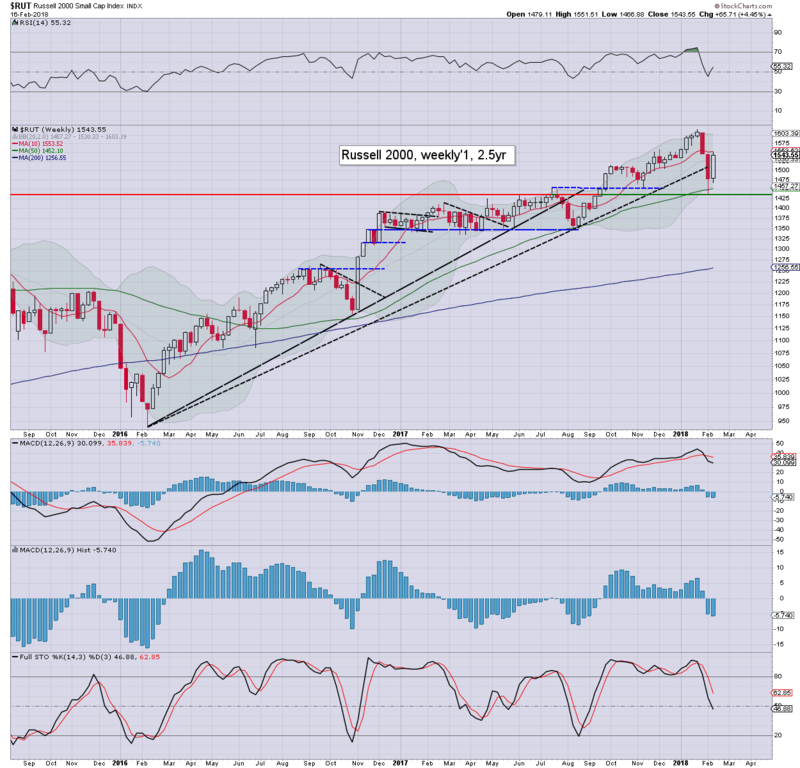 Near term outlook offers further upside to the 2800s. 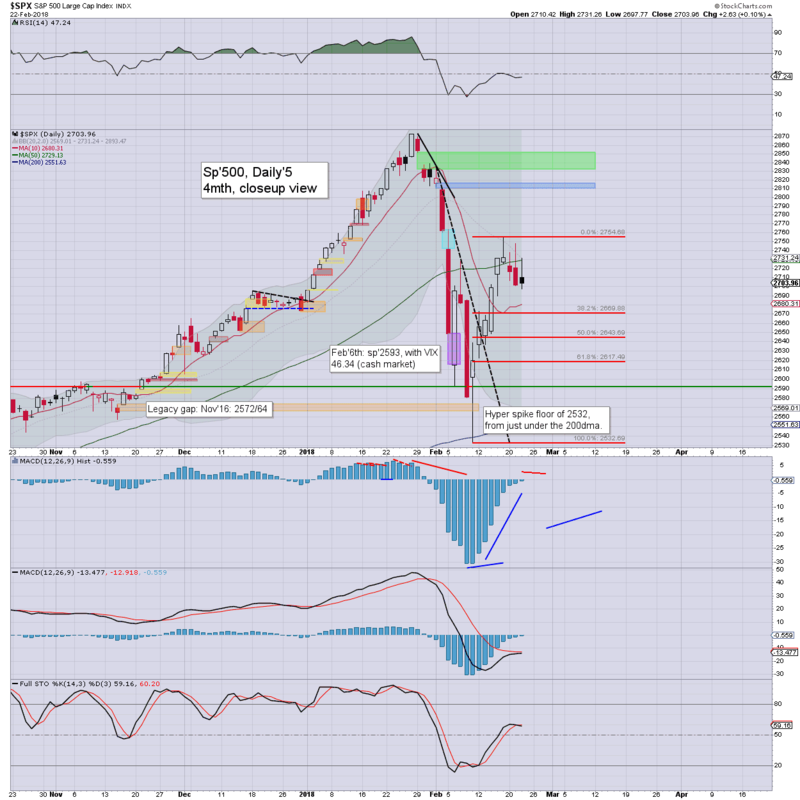 More broadly, big target is the sp'2950/3047 zone, which is well within range by mid year. A second consecutive net weekly gain, settling +15pts (0.5%) at 2747, as the bears could only manage a minor retrace from 2754 to 2697. 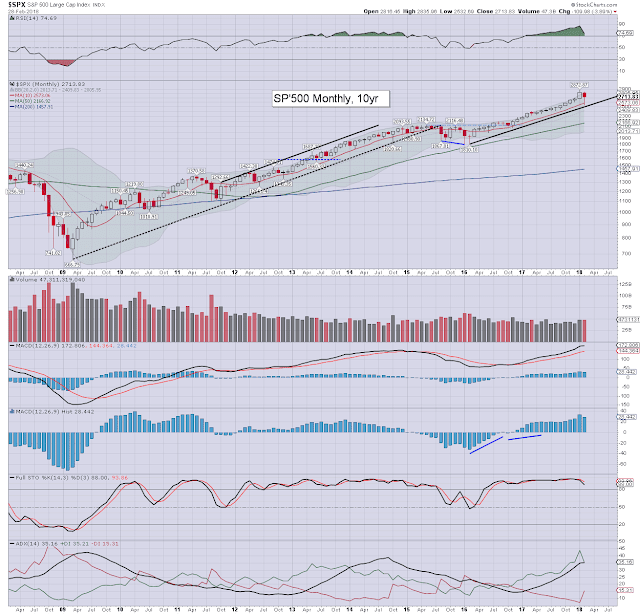 With s/t price structure of a bull flag provisionally confirmed, a return to the 2800s in March looks on the menu. 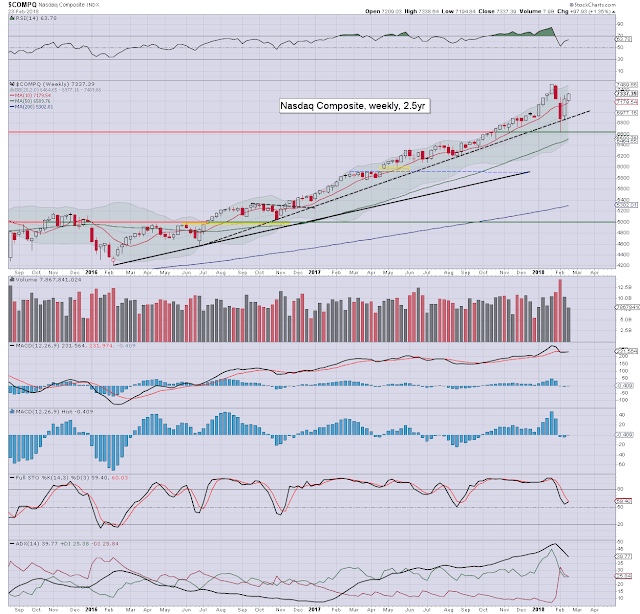 Best guess: climbing to the 2800s in March, with the 2950/3047 zone by mid year. The latter zone has multiple aspects of key resistance, which should see the market get seriously stuck. 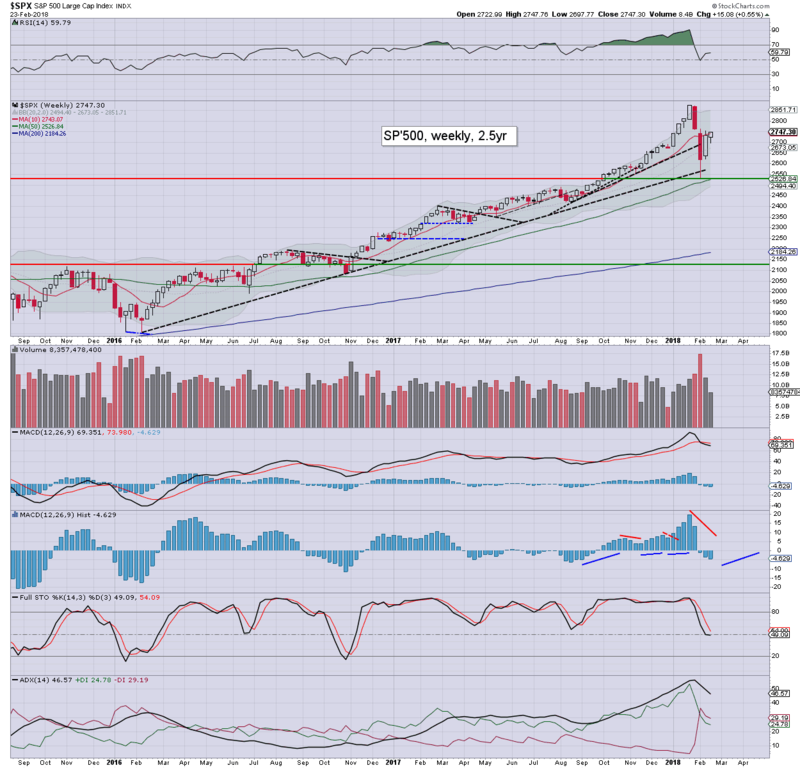 Its notable that sp'3K would make for a natural cycle peak. Considering the recent 11.8% retrace, the next down wave could be expected to be stronger, on the order of at least 15/20%. Again though, the subsequent rebound would likely be equally strong. 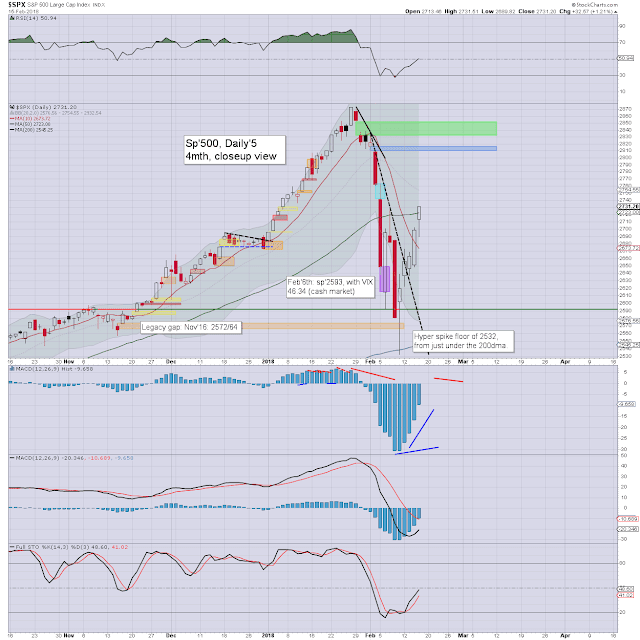 The year end target of 3245 still appears on track. Equity bears have little to tout unless a bearish monthly close. 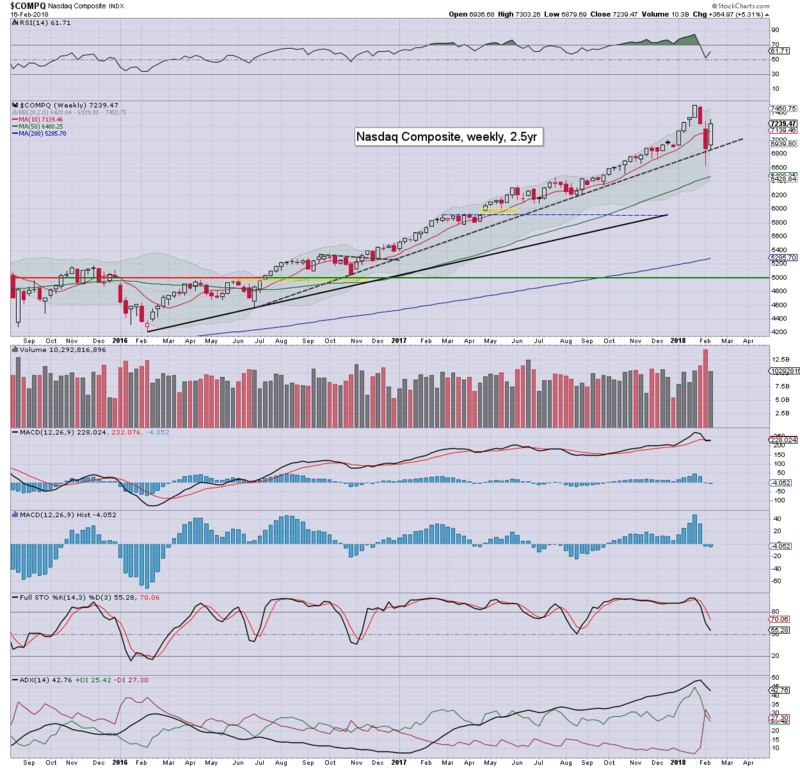 For yours truly, that would equate to a monthly close under the monthly 10MA. That is currently at 2576, and is climbing 35/45pts a month. 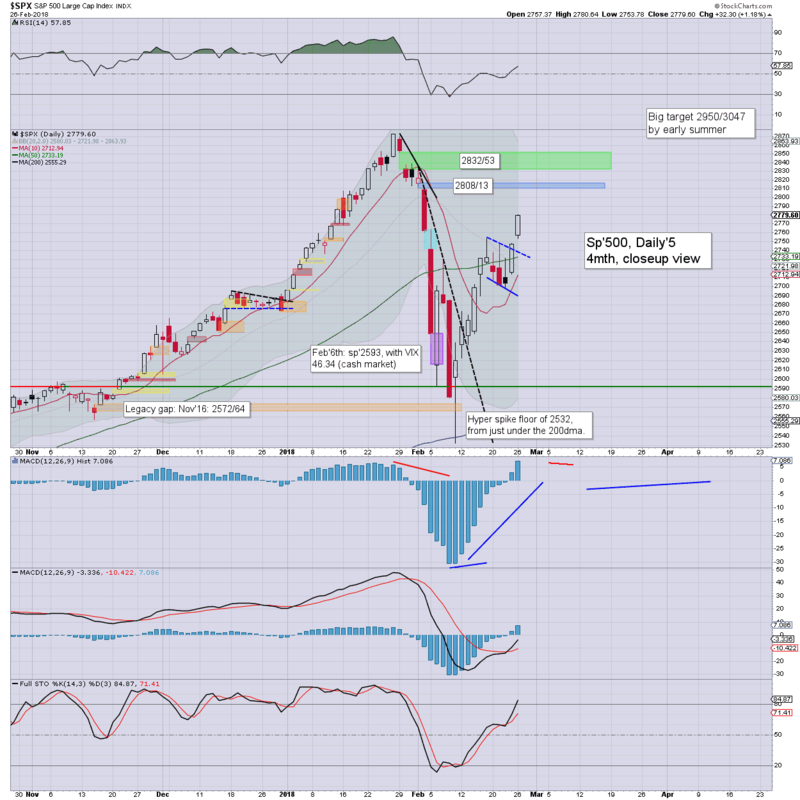 After the recent correction, I am open to a monthly close under the key 10MA this summer, but I'd still suspect that it would merely make for a washout, with resumed powerful upside. The price action from 1998, or even 1987 would be valid scenarios. Tech is leading the way back upward, +1.3% at 7337, which is already very close to the Jan' historic high of 7505. The 8000s look well within range by late spring/early summer. The mighty Dow gained 90pts (0.4%) to 25309. Keep in mind the recent hist' high of 26616. Further, note the 2.618x Fibonacci extrapolation of 26701. 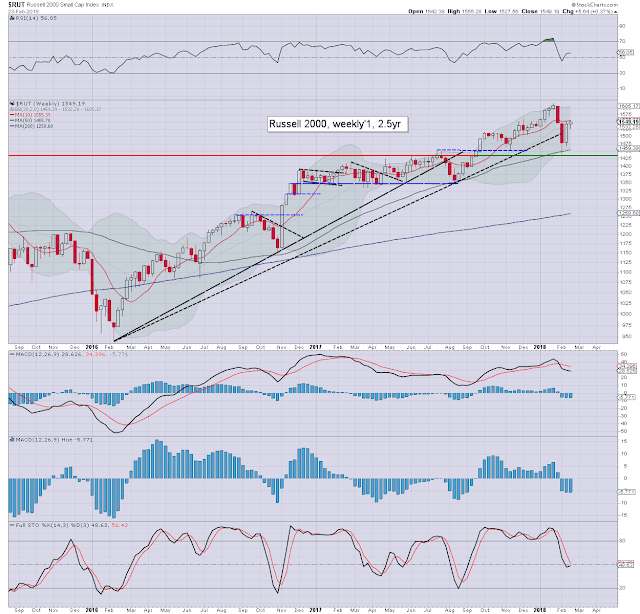 Any price action >26800s would be decisive, and eventually bode that even if there is a very severe drop this summer/autumn, the main market should still quickly recover, and make another push to sp'4-5K before the grander cycle has fully played out. Certain 'signal' stocks, such as INTC, X, and BAC are suggestive of that hyper bullish outlook. 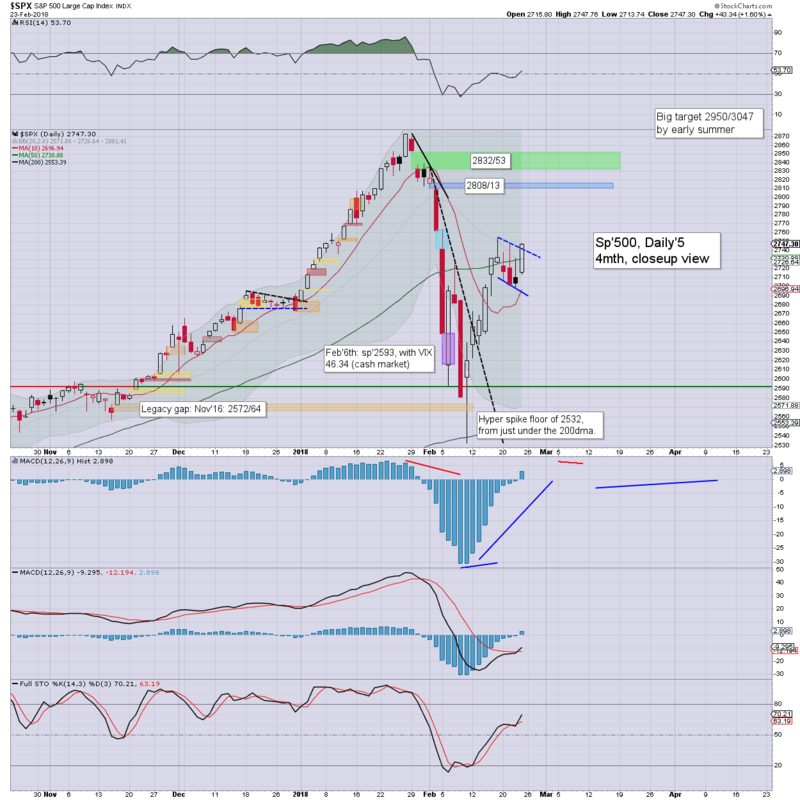 The master index gained just 0.1%, settling at 12884, notably still under the key 10MA. 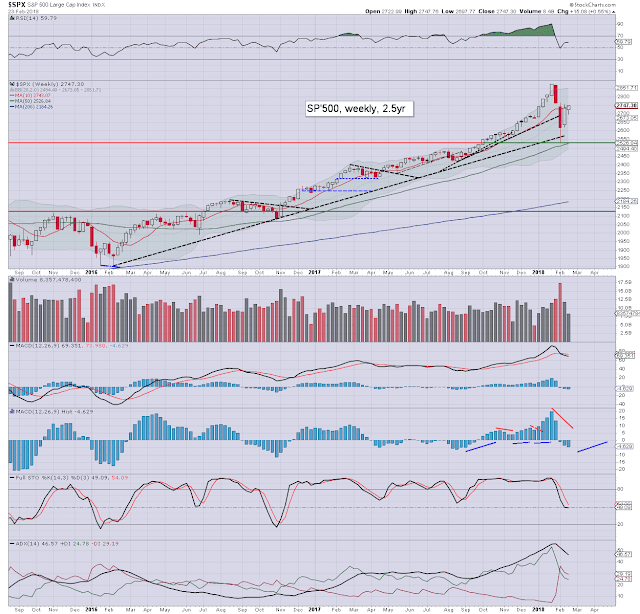 A push to the 14000s seems feasible, if sp'3K this early summer. 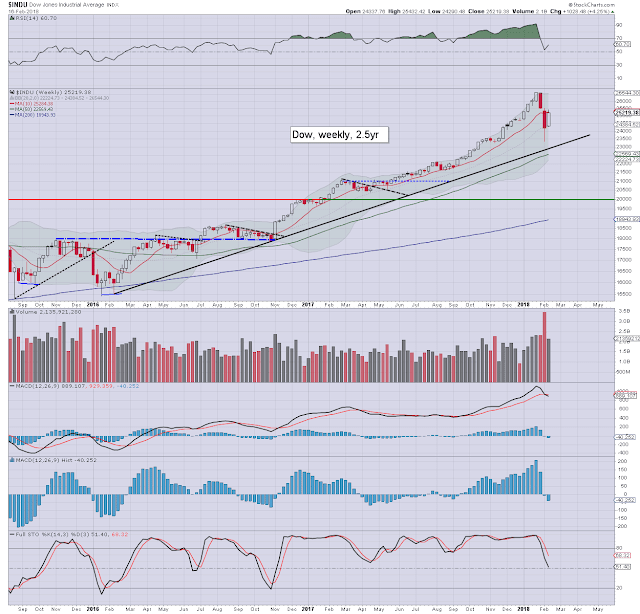 The second market leader - R2K, climbed for a second week, +0.4% to 1549. 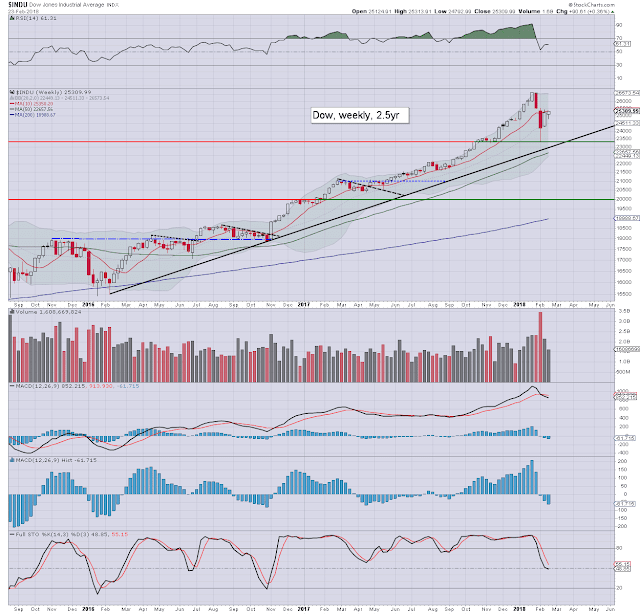 The Jan' high of 1615 looks a valid target within 2-4 months, before the next threat of a major drop. The 'old leader' - Transports, gained 0.7% to 10578. 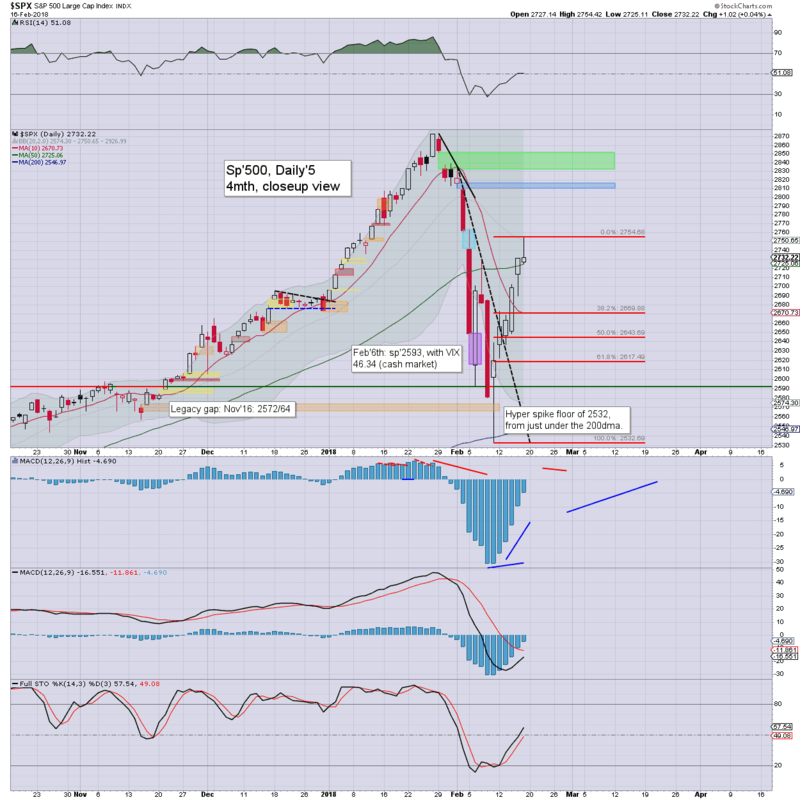 The Jan' high of 11423 is 8.0% higher, and that looks out of range until at least April. A choppy week for US equities, but all six main indexes settled net higher. The Nasdaq is leading the recovery, with the NYSE comp' trailing. The key low from Feb'9th looks secure into/across the spring. Considering the power of the recent correction, a stronger wave - from around sp'3K, could be expected this summer/early autumn, on the order of 15/20%. Notable retail earnings: Lowes (Wed), and JCPenney (Fri'). Fed Chair Powell will appear 10am, before the US House. That will garner blanket coverage on the financial networks, and Mr Market will be hanging on every single word. W - GDP Q4 (second est'), Chicago PMI, Pending home sales, EIA Pet' report. **As Wednesday is month end, expect more dynamic price action and higher volume. For the chartists out there, the monthly settlements will be massively important. US equity indexes ended the week on a significantly positive note, sp' +43pts (1.6%) at 2747. The two leaders - Trans/R2K, settled higher by 1.4% and 1.2% respectively. VIX settled -11.9% at 16.49. With the close above the 50dma, near term outlook offers further upside to challenge two key price gaps in the sp'2800s. First, yesterday's call of a weekly close around 2670/60... lousy. The cooling wave from 2754 to 2697 was very minor, and highly indicative of underlying mid/long term market strength. Yesterday's appearance from Fed official Bullard, and today's pre-emptive release of Powell prepared remarks clearly skewed things into the weekend. US equities opened moderately higher, and once again, the market built gains into early afternoon.Unlike the previous three days though, the gains held, and after a few hours of micro churn, were built upon. Price structure can now be seen as a bull flag, provisionally confirmed. The flag will be fully confirmed with a break above last Friday's high of 2754. A number of stocks - such as AAPL, BABA, X, and MU, are strongly suggestive we'll see a push into the 2800s by mid March. 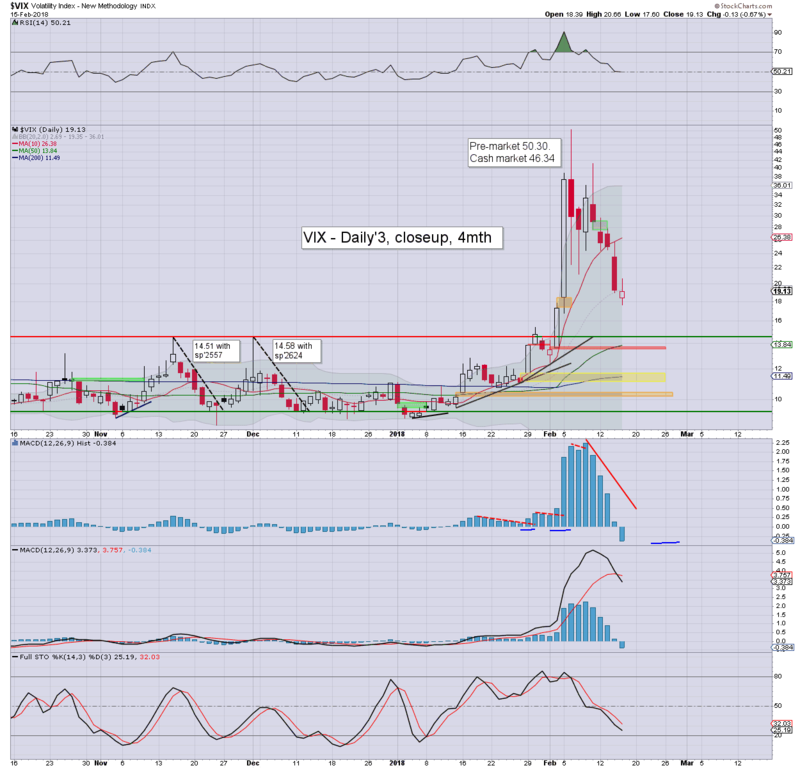 VIX: With higher equities, volatility was naturally ground lower, settling in the 16s, the lowest level since Feb'2nd. Yes, the market remains twitchy about the US 10yr bond yield, remaining close to the psy' level of 3.00%. So long as that isn't broken above, the bullish equity train will remain on the tracks. Indeed, original big target of 2950/3047 zone is still on the menu, where we'll surely get stuck. 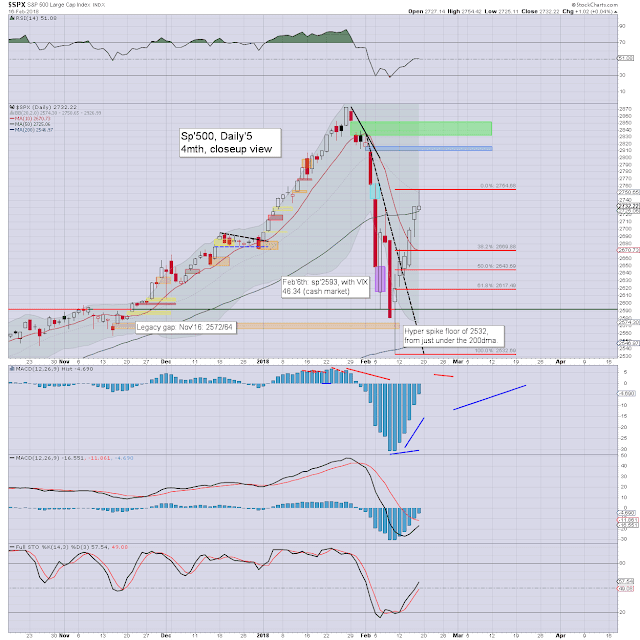 *the weekend post will appear Sat'12pm, and will detail the US equity indexes. US equity indexes closed moderately mixed, sp +2pts at 2703 (intra high 2731). The two leaders - Trans/R2K, settled +0.5% and -0.1% respectively. VIX settled -6.5% at 18.72. 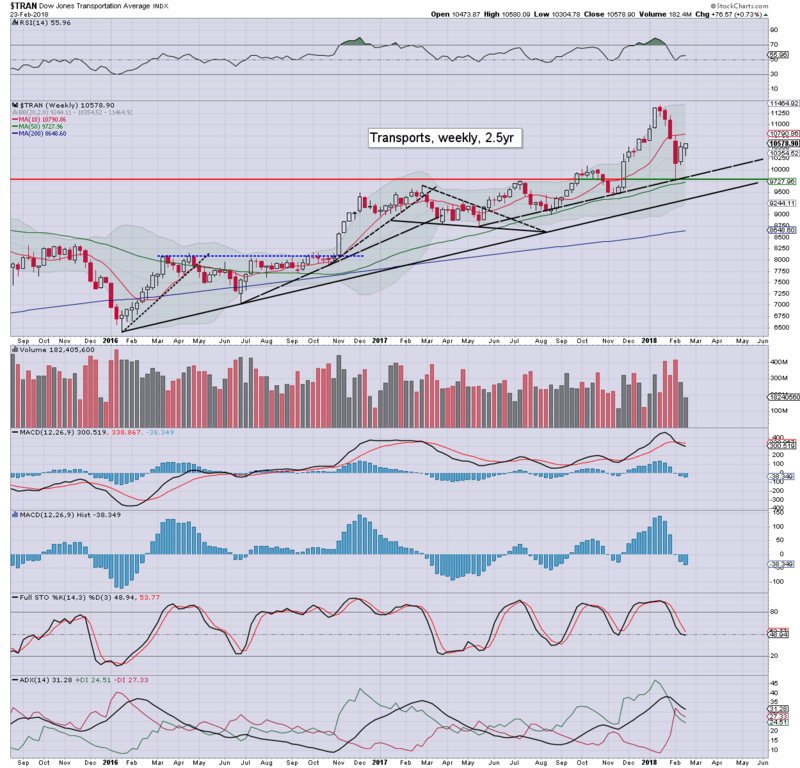 Near term outlook offers cooling to at least sp'2670/60s, with secondary of 2620/10s. The recent key low of 2532 should comfortably hold. The day began with the Federal reserve wheeling out Bullard, aka.. the 'bane of the bears'. A fair question is... how far ahead was this scheduled? I honestly have no idea. 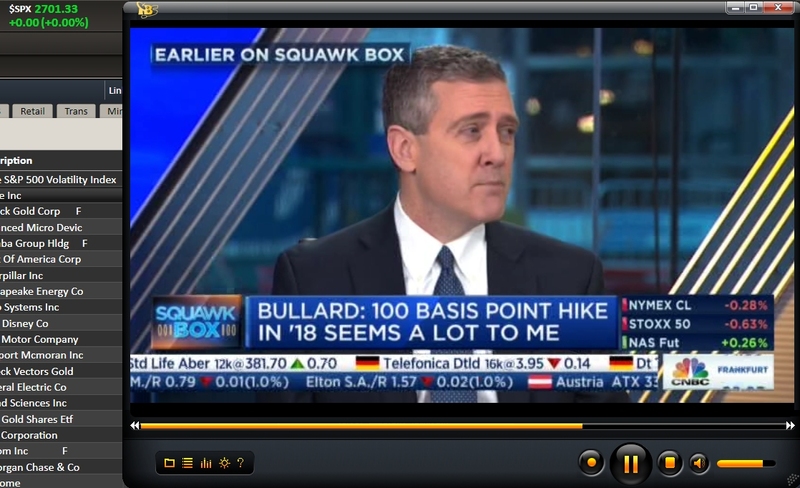 Regardless, Bullard was obviously trying to quell market concerns that the fed might raise four times this year. There is no doubt the fed are doing what they can to calm the equity/capital markets. I can't blame them, as they are clearly scared that equities might unravel into early/mid March. If that was the case, then they would not hike. No hike this March 21st would be a disaster, as the broader capital US/world capital markets would be monstrously spooked on the notion of 'what terrible thing has happened?'. Fed chair Powell is due before the US house next Wednesday, so if the market does unravel across the next few days, the bulls will have the CEO of Print HQ to 'inspire' things back upward. 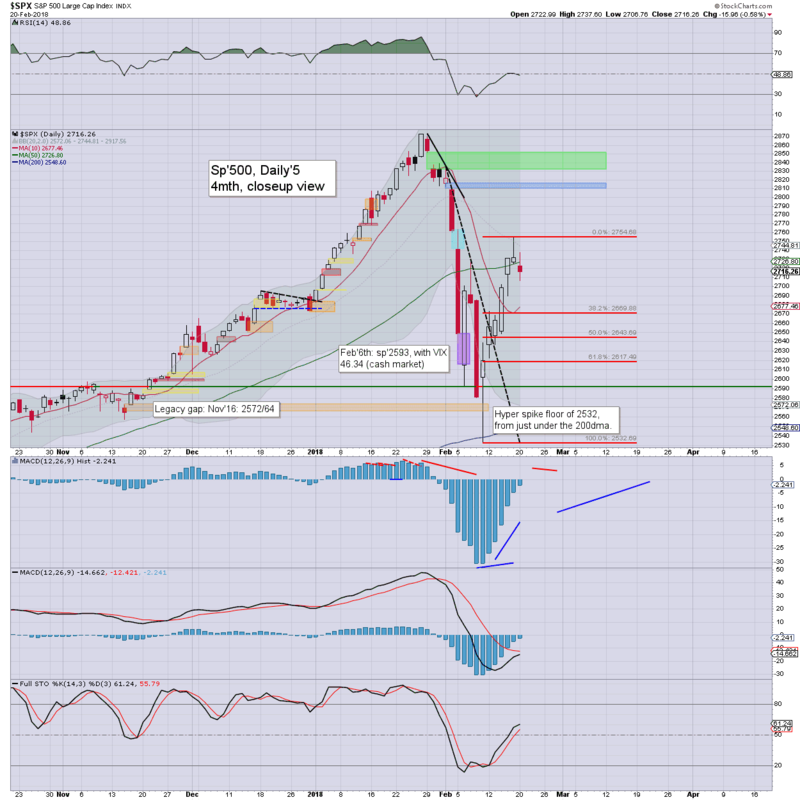 Note today's black-fail candle in the sp'500, with a spike from around the 50dma. This is the third consecutive failed rally to break/hold the 50dma. Its arguably VERY bearish for the s/t. Basic target of 2670/60s looks pretty easy, and in theory, should be seen tomorrow. 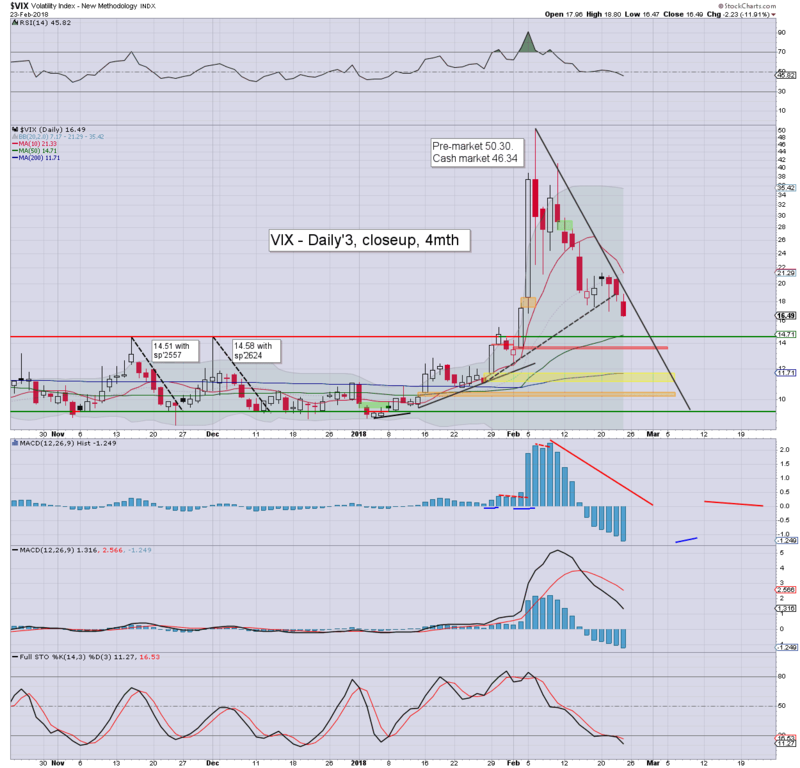 VIX: a second day lower, but its notable that the VIX remains relatively elevated. Just consider that last year saw a momentary peak in the 17s, whilst the upper teens are currently a floor. A jump to the 25/30 zone is very viable within 1-3 days. We're still holding above the key 10MA, and on any realistic outlook, that will remain the case into next Wednesday's monthly settlement. ... and after some days of grey horror, that was a much needed sunset at 12.05pm EST. US equity indexes closed on a very weak note, sp -14pts at 2701. The two leaders - Trans/R2K, settled +0.3% and +0.1% respectively, but way below earlier highs. 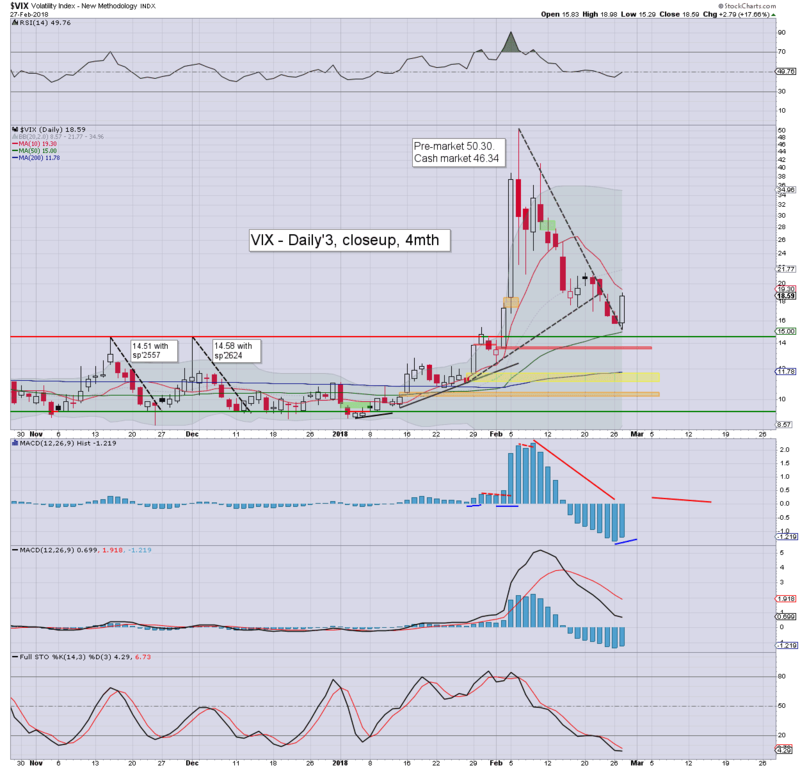 VIX settled -2.8% at 20.02. 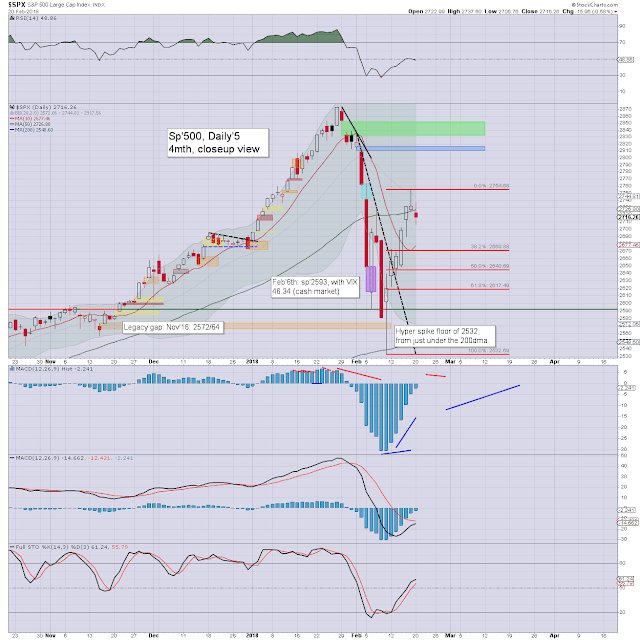 Near term outlook offers a retrace to 2670/60s. There is a risk this will be greatly exceeded, as the mainstream are using the excuse of higher yields to panic. US equities opened a little higher, and battled to build moderate gains into the afternoon. The Fed' minutes appeared at 2pm, and the algo-bots initially spiked the market to a new intraday high of 2747. However, as bond yields climbed, the mainstream used it as another excuse to panic.The sp' saw a mini implosion, swinging 46pts lower to settle at 2701. Volatility naturally had a mixed day, crushed lower to a new cycle low of 16.97, but then seeing a mini ramp, to settle just above the key 20 threshold. To be clear... a short term retrace does seem underway from last Friday's high of sp'2754. I'm looking for the 2670/60s, but its possible we will see a few days of sig' weakness beyond that, to come close to testing the recent key low of 2532. Feb'22nd will mark six years since I started regular online postings about the world's most twisted casino. As well as my mini legion of paying subscribers, I do also want to thank a few of those people who first linked back to me in 2012, not least Chartrambler, Joe McVerry, and 'Albertarocks'. There are others, some of whom are still listed within my blog links lists. Things have greatly changed here, since I took my intraday posting to a subscription basis in May 2016. I still endeavour to provide something useful here... if only a couple of charts with a few short paragraphs. I have long intended to 're-brand' both my public and private sites to something that better describes me. In that... I've failed. I'm frankly... just exhausted. For the moment, the quirky online moniker of 'Permabear Doomster' still lives... but it (hopefully) won't be around forever. I'm having technical problems with the server that hosts my subscription site. I might just post everything here tomorrow. We'll see. US equity indexes closed broadly weak, sp -15pts at 2716. The two leaders - Trans/R2K, settled -1.5% and -0.9% respectively. VIX settled +5.9% at 20.60. 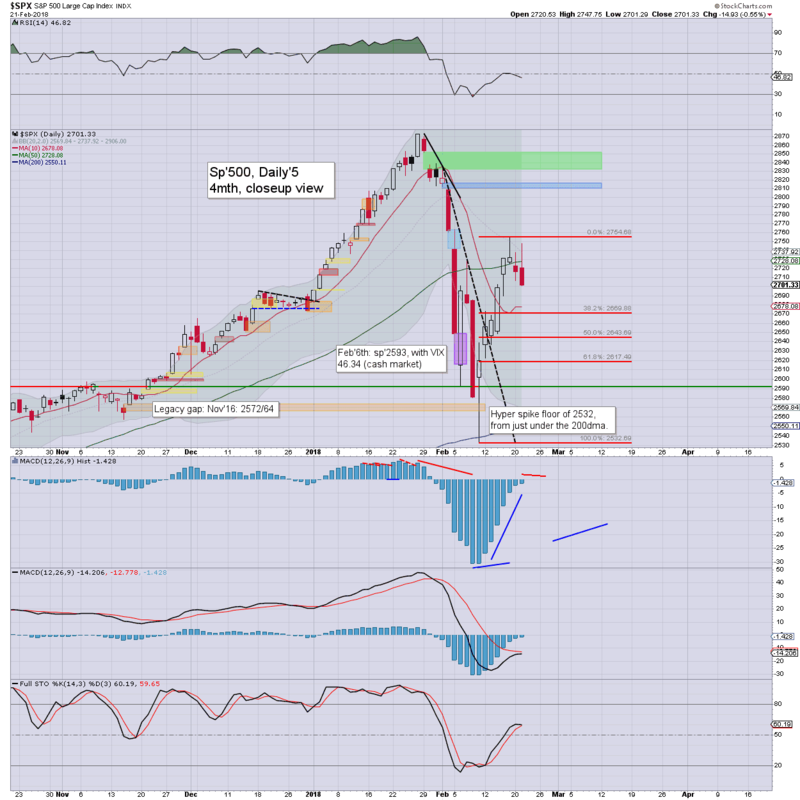 Near term outlook offers cooling to around sp'2670, which would likely equate to VIX 25/30. M/t outlook remains bullish, with big target of 2950/3047, where things will get real interesting. It was a day of moderate chop, opening lower to sp'2717, recovering to 2737, but then breaking a new low in the afternoon of 2706. 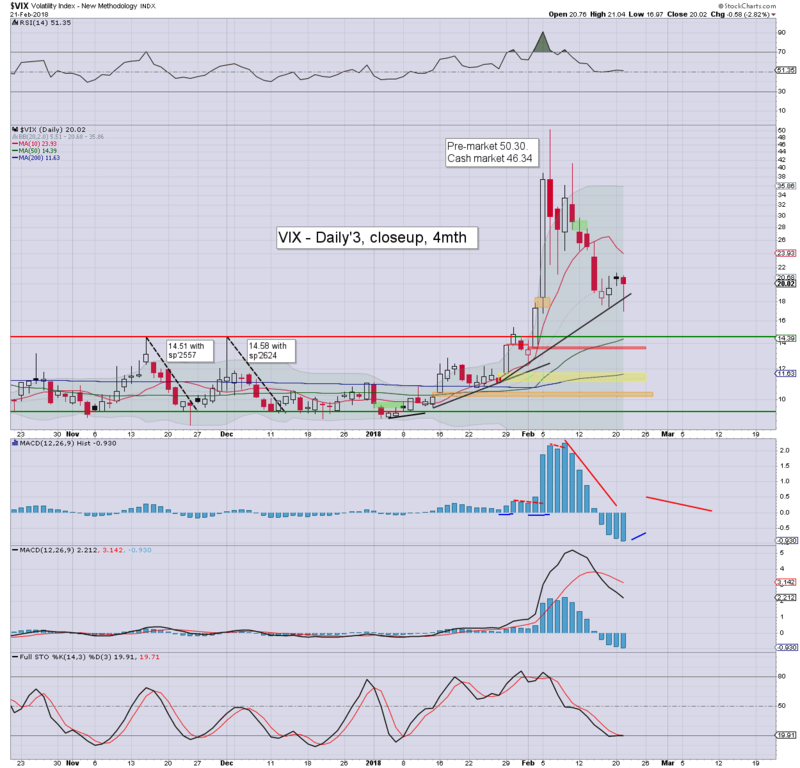 Volatility remains relatively elevated, with the VIX settling above the key 20 threshold. 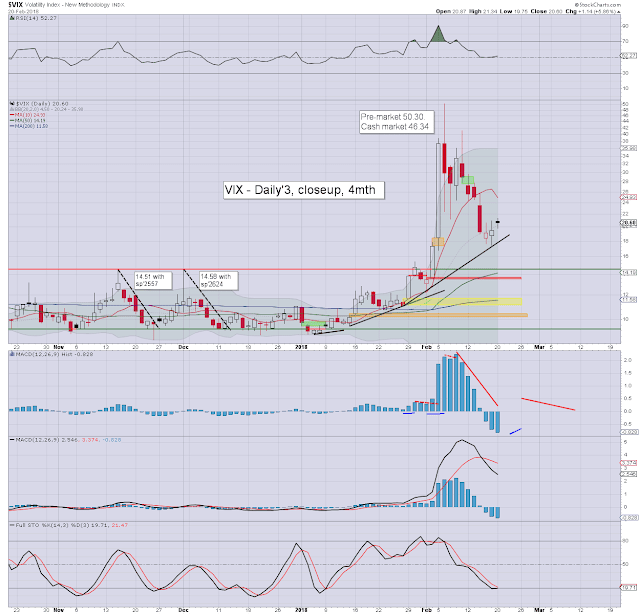 Further cooling to around sp'2670 is due within days, and that should equate to VIX within 25/30 zone. To be clear, I do NOT expect 2532 to be broken, before a push to big target of 2950/3047 zone, where they are many key aspects of resistance. That will clearly take some months to play out. 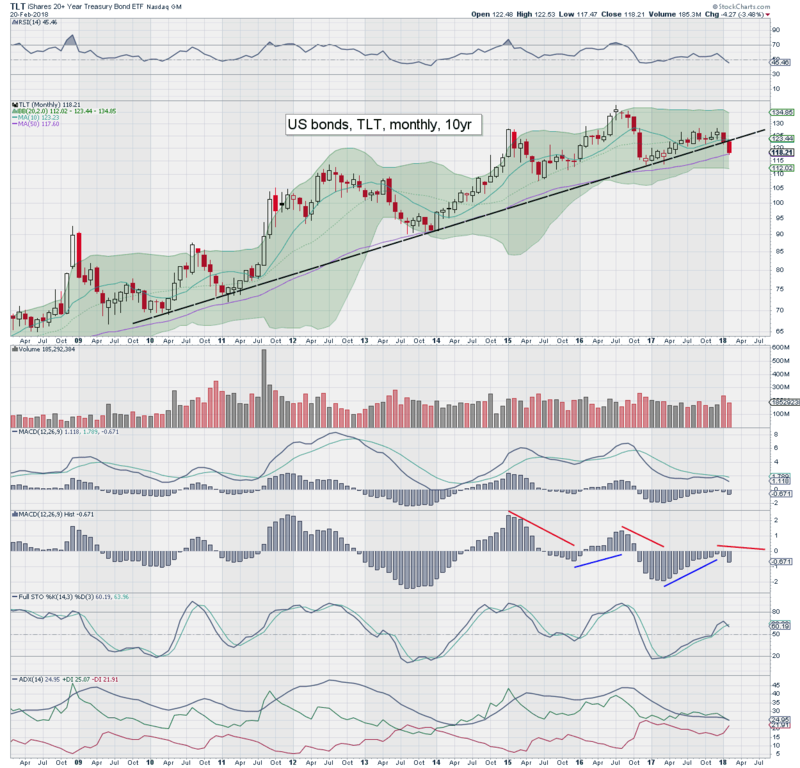 The bond bulls should be very concerned at what is a decisive break of the multi-year upward trend. Inherently, a fall in bond prices leans to higher equity prices. Further, I would look for direct capital flows out of bonds and into equities. 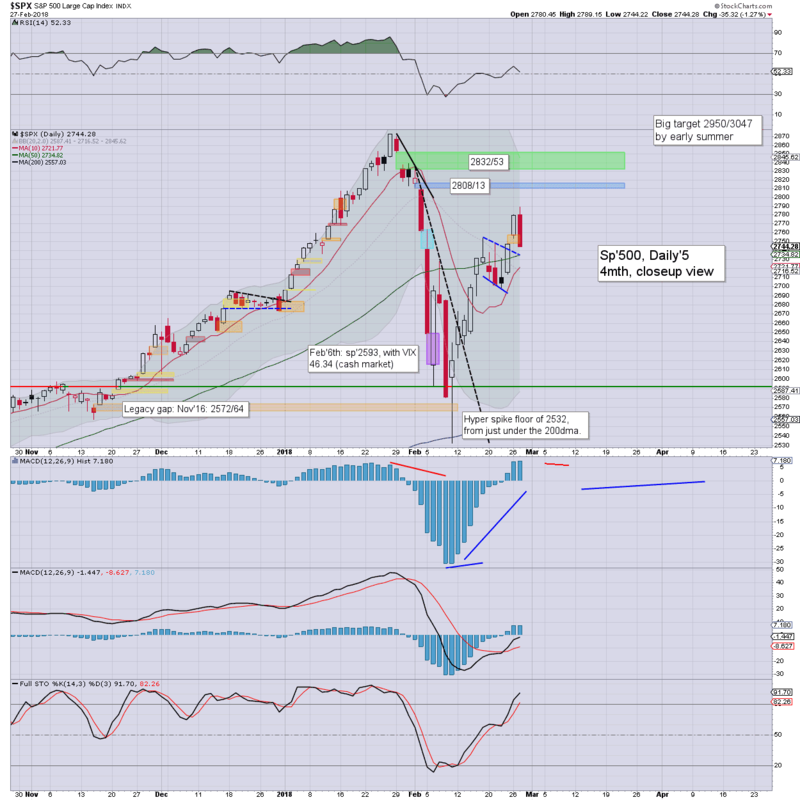 It was a powerfully bullish week for US equity indexes, with net weekly gains ranging from 5.3% (Nasdaq comp'), 4.3% (sp'500), 3.8% (R2K), to 3.6% (Trans). Near term outlook offers a retrace of 2-3%, but then resuming upward across March. More broadly, next big upside target is the sp'2950/3047 zone. 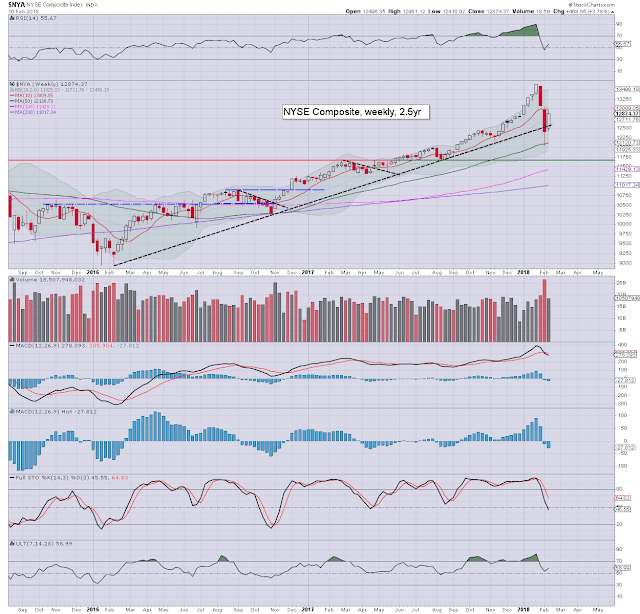 The sp' saw a powerful net weekly gain of 112pts (4.3%) to settle at 2732, with a Friday peak of 2754. 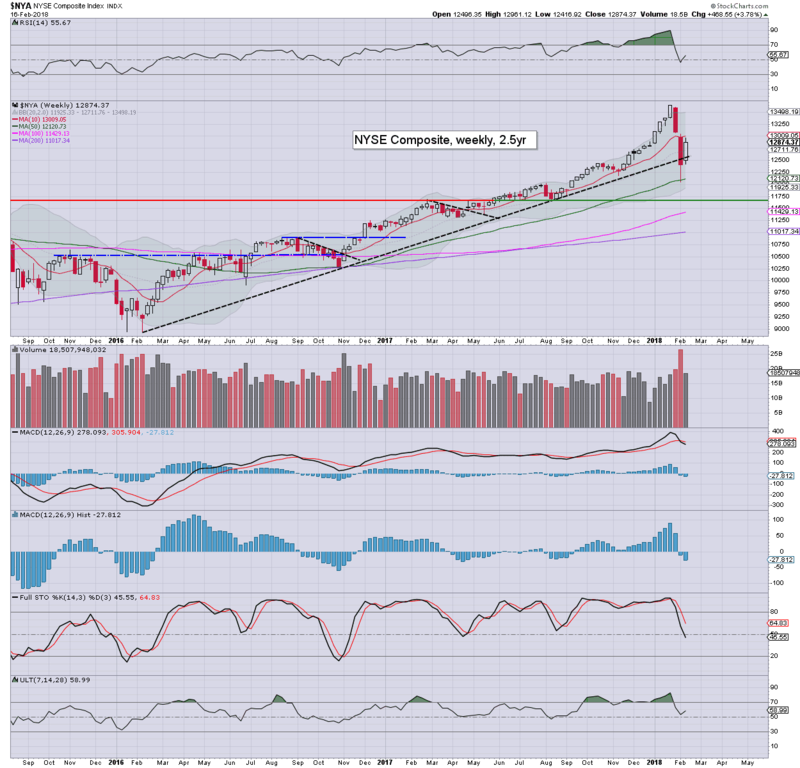 Note the weekly 10MA, which the market settled under for a second consecutive week. Best guess: s/t cooling of 2.5% to around 2670, before swinging back upward across March. 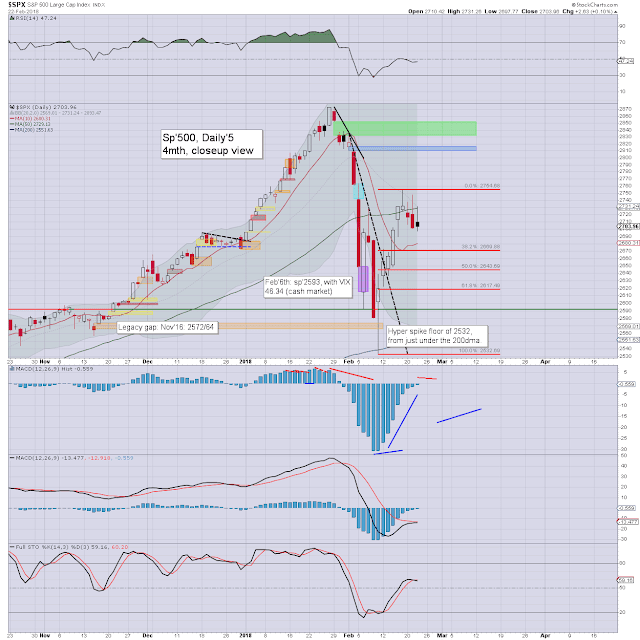 Big target remains the 2950/3047 zone, where the market will be extremely prone to becoming stuck. Considering the recent correction of 11.8%, the next bearish wave could be expected to be somewhat bigger, on the order of 15/20%. Again though, any subsequent rebound would likely be equally strong. The year end target of 3245 still looks good. Equity bears have nothing to tout unless a bearish monthly close. For yours truly, this would equate to a monthly settlement under the monthly 10MA. That currently stands at 2574, and is rising by 30/40pts a month. It is possible we will see such a monthly close this summer, but I would expect a fast rebound within the following 1-2 months. The price action from summer/autumn 1998 is a good example. Tech is leading the way back upward, seeing a very powerful net weekly gain of 5.3% to 7239. S/t cooling to 7100/7000 looks due, before resuming upward across March. 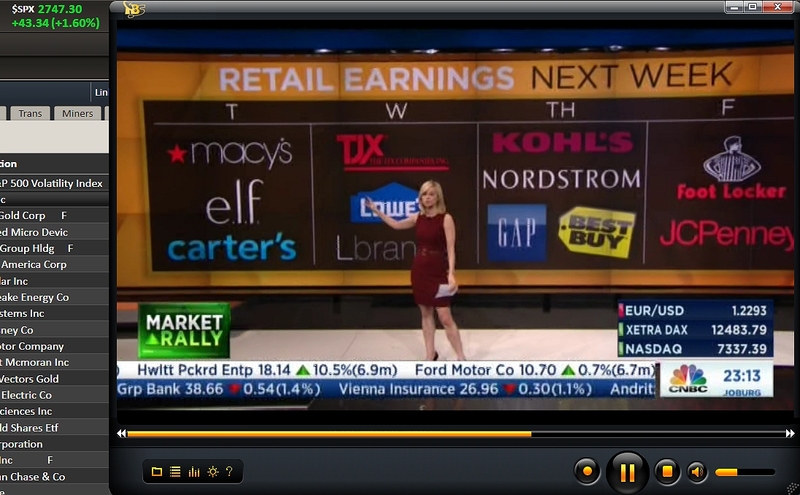 The 8000s look very viable by mid year. The mighty Dow rebounded by 1028pts (4.25%) to 25219. S/t cooling of 500/600pts looks viable within the near term, before resuming upward to break new historic highs in the spring/early summer. The master index gained a very significant 3.8% to 12874. Near term outlook offers some cooling of around 2%, before resuming upward. 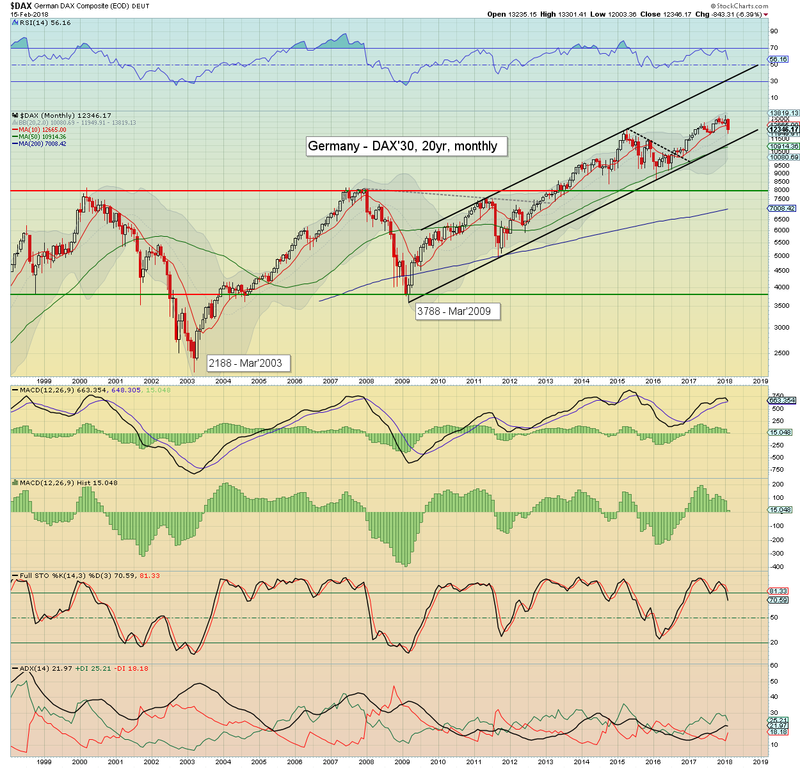 New historic highs (>13637) look very probable within 2-3 months, with the 14000s viable this summer. The second market leader - R2K, gained 4.45% to 1543. Half of this week's gains could be eroded within 3-5 days, but then resuming upward into March. New historic highs (>1615) look very viable by late spring, not least if rates are raised March 21st (bullish financials) and if WTIC (bullish energy stocks) is close to the psy' $70 threshold. 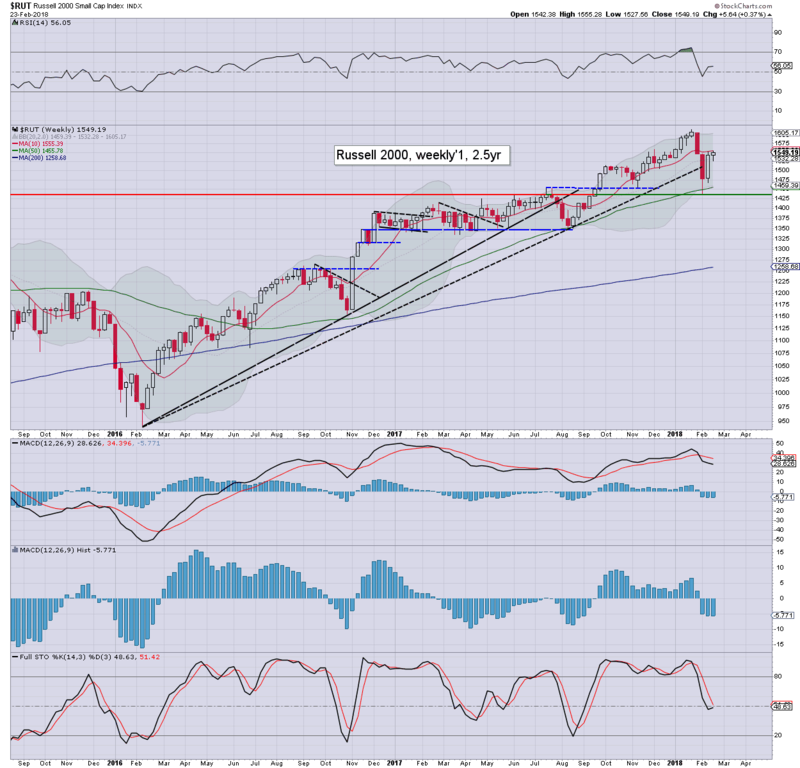 Right now, 'R2K @ 2K' still looks out of range until spring/summer 2019. The 'old leader' - Transports, rebounded by a very significant 3.6% to 10502. S/t cooling of 200/300pts appears probable, before resuming upward with the rest of the market. 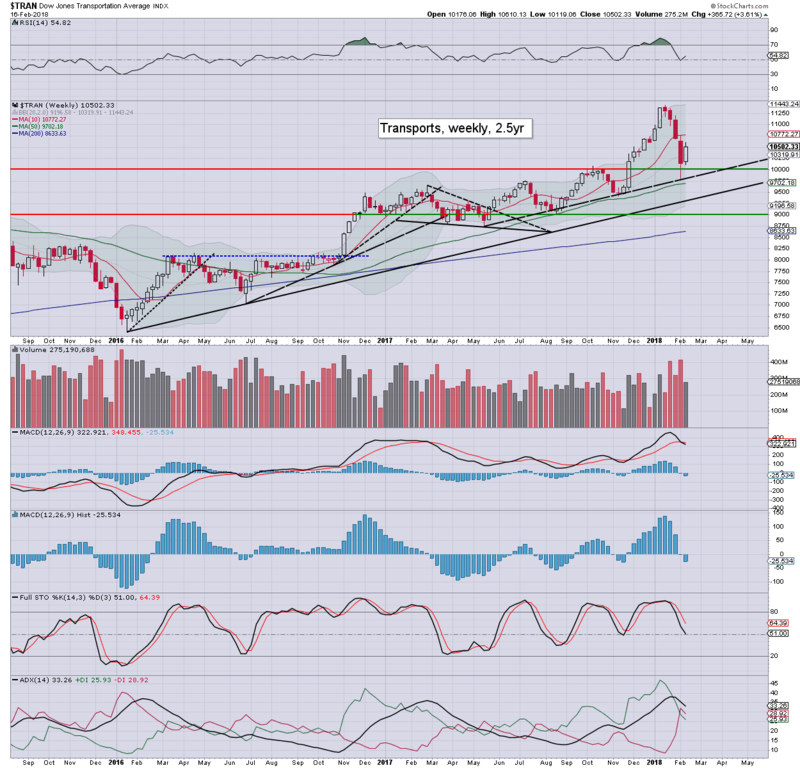 Its notable that higher WTIC/fuel prices will be a significant downward pressure on the transportation stocks. However, US growth should be enough to negate this factor, although the Trans will likely lag the rest of the market across this year. A powerfully bullish week for all six of the main indexes. Tech is leading the way upward, whilst the Transports is the laggard. The recent downside was powerful, but the rebound is equally so, and indicative that US equities still retain underlying super strength. That view will be fully confirmed if the majority of indexes can break new historic highs in late spring/early summer. Equity bears have nothing to tout unless most indexes see a bearish monthly close. Even then, I'm highly inclined to see that as just a washout, in the style of 1998 or 1987. *the next post on this page will likely appear 6pm EST on Tuesday. US equity indexes closed moderately mixed, sp +1pt at 2732. The two leaders - Trans/R2K, settled -0.5% and +0.4% respectively. VIX settled +1.7% at 19.46. 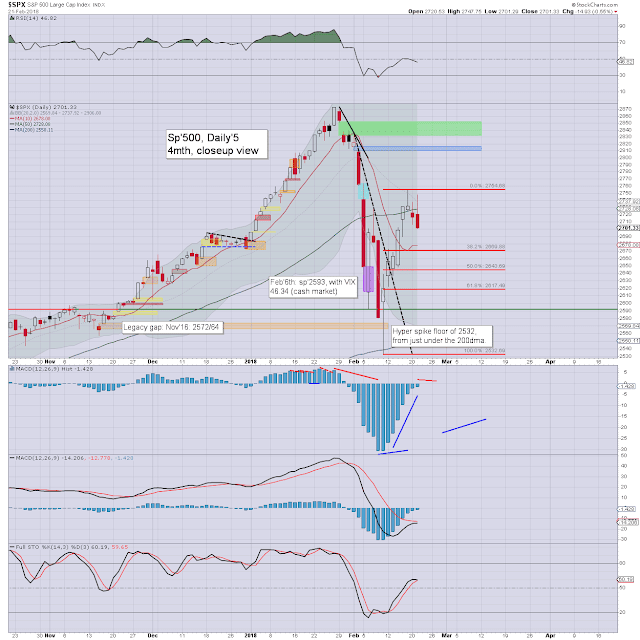 Near term outlook offers a basic retrace of 2.5% to around sp'2670. More broadly, big target remains the sp'2950/3047 zone. US equities opened in minor chop mode, but then built moderate gains into late morning, breaking a new cycle high of 2754, some 222pts (8.8%) above last Friday's low. Pretty incredible. The 2754 high does appear to be a short term top, with the sp' seeing distinct cooling to fractionally negative in the afternoon. Volatility opened fractionally higher, but cooled into the 12pm hour. 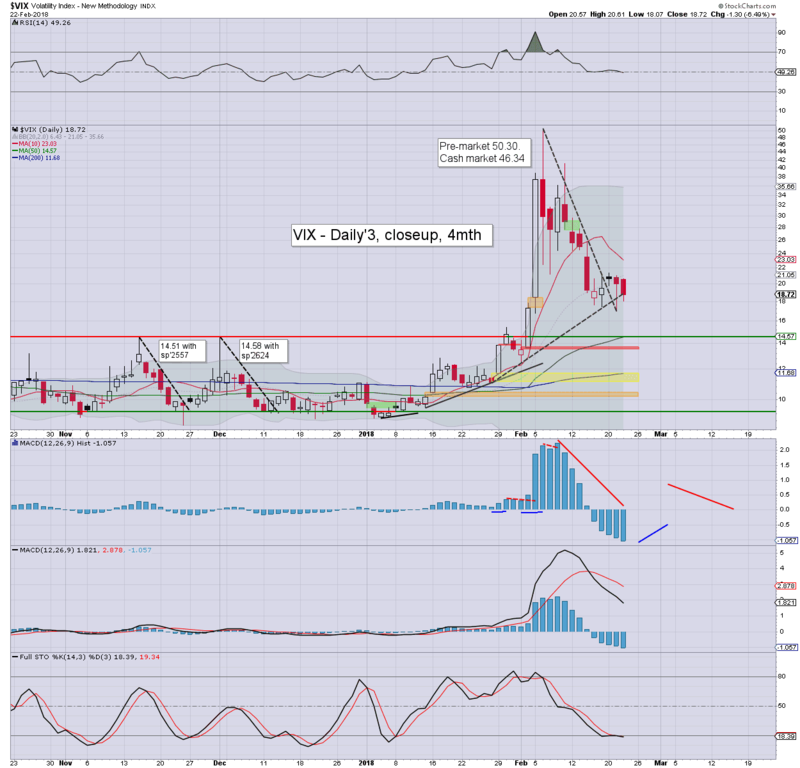 With equities cooling in the afternoon, the VIX swung significantly upward. Best guess: equity cooling to around sp'2670, which should see the VIX back in the 25/30 zone. 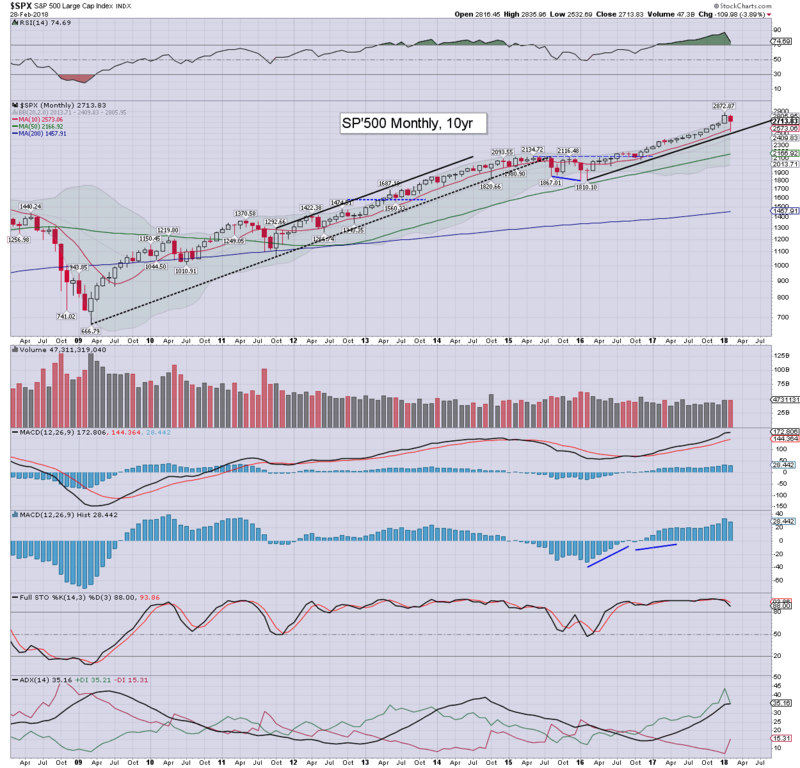 More broadly, m/t bullish, with big target of sp'2950/3047 by late spring/early summer. Then things will get 'really interesting'. US equity indexes closed broadly higher, sp +32pts (1.2%) at 2731. The two leaders - Trans/R2K, settled higher by 0.7% and 1.0% respectively. VIX settled -0.7% at 19.13. Near term outlook offers chop into the opex/3 day weekend. A test near/at the recent sp'2532 low remains a high threat into end month. US equities opened moderately higher, saw an early high of 2717, and then cooled back to around u/c. Yet again, the buyers appeared, pushing strongly upward into the afternoon. Today's high of 2731.51 is notably 198.82pts (7.8%) above last Friday's low. Volatility saw a mixed day, seeing a high of 20.66, but settling lower for a fifth consecutive day in the low 19s. 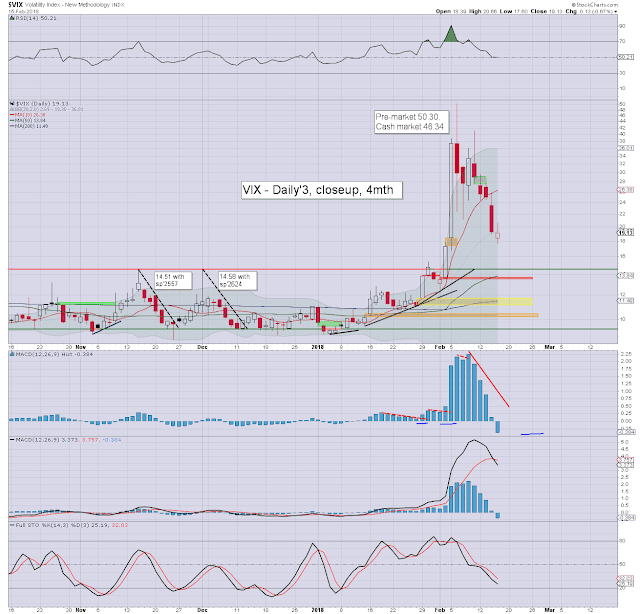 Considering a 3 day holiday weekend is ahead, the VIX will likely see further cooling on Friday. With 9 trading days left of February, the DAX is currently -6.4% at 12346, notably still under the key 10MA. The German market is central to the EU, and how it settles the month should be seen as very important. Cyclically, its looking ugly, as a bearish MACD cross is due.